Soft Cover, 160 pages, 8.5 x 11. From Alpenbrau to Zima, this engaging book features more than 450 color photos of some of the most attractive beer signs ever created and provides an in-depth look at this significant aspect of advertising art. Included are early wood and cardboard signs, animated, hanging, and wall-mounted signs, electric lanterns, and clocks�all presented in alphabetical order according to brand of beer. 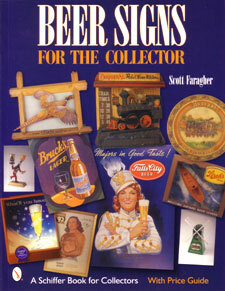 Special emphasis is given to electric, lighted, and animated signs from 1950-1970, the �Golden Era� of beer signs. Captions provide valuable information on dates, sizes, values, manufacturers, and manufacturing techniques. A treat for aficionados of breweriana and advertising alike!